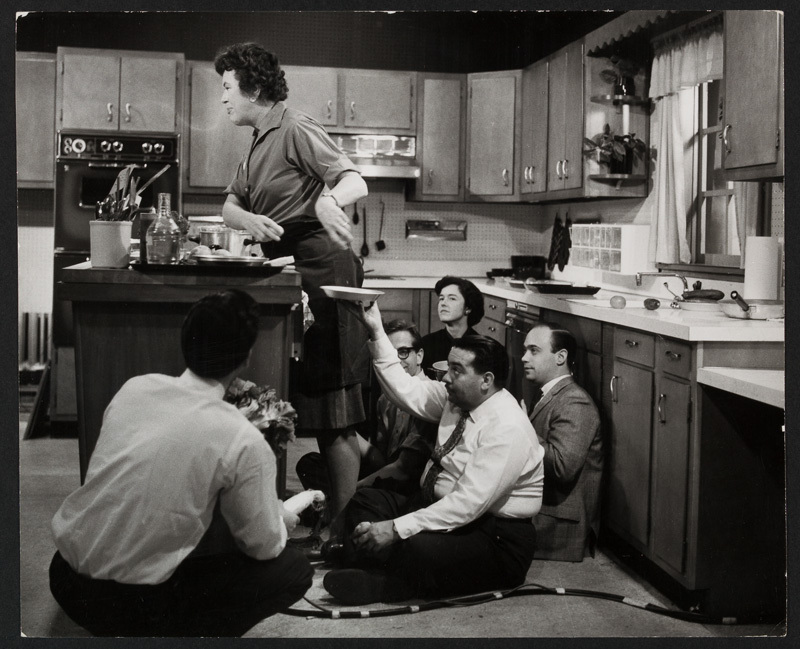 This photo of Julia Child filming a promo for “The French Chef” kinda drives home why I haven’t put together a YouTube food series. Now if I had 5 people literally hiding behind the scenes, in addition to a film crew, maybe I could pull it off too! I tried making a video about how to make simple syrup and it was awful. The basics were there, but the lighting got weird, the camera tripod wouldn’t stay in position, then trying to edit the bits together gave me a headache. Julia Child, I ain’t! Especially considering that “The French Chef” was shot start-to-finish, no cuts, no editing together. I seriously doubt any of today’s food lifestyle show hosts could manage that. And yet, I would still love to have a cooking show. I need to do some studying on producing short segments on my own. I probably need a better camera and lighting than I already have, but let’s face it, I don’t have sponsors!1 Even though my food photographs are clearly so good that people want to steal them, which is… well, kinda crappy. "Oh, is that your photo? We thought we'd just take it without your permission and use it in our advertising. We cool, right? Yeah, we cool." Still, if anyone out there is just itching to be a production elf — and knows something about video production — do hit me up! I have this swirling idea to do something for my birthday in a few weeks, but I might not, who knows? 1 #realtalk If anyone out there wants to sponsor me, please let me know.